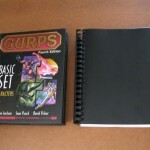 It served me well through many a GURPS campaign, but I misplaced it earlier this year. So this time around I decided to give Lulu a chance, and I love the results. 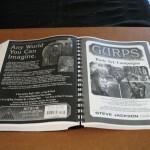 The binding is solid, hasn’t cracked in the first few go-rounds, and absolutely won’t lose a page. The book itself is light — it feels lighter to my hand than holding the two single volumes (with their deliciously slick, full-color pages). Which leads to the first of only two downsides: the pages are black and white, so you lose the utility of the color-coded bottom margins. This doesn’t bother me at all, I generally know what I’m looking for, but I thought it worth noting. You can, of course, go with color printing, but I don’t imagine the price would be economical. Believe me when I say, this is the sort of thing that would normally drive me berserk. But for some reason, maybe because it is so slight, I only notice it when I want to. Worth mentioning, though, because it doesn’t appear in my PDFs, and it only occurs in a few random sections of pages, so it’s got to be something on their end. The only thing I wish I had done differently is the back cover. 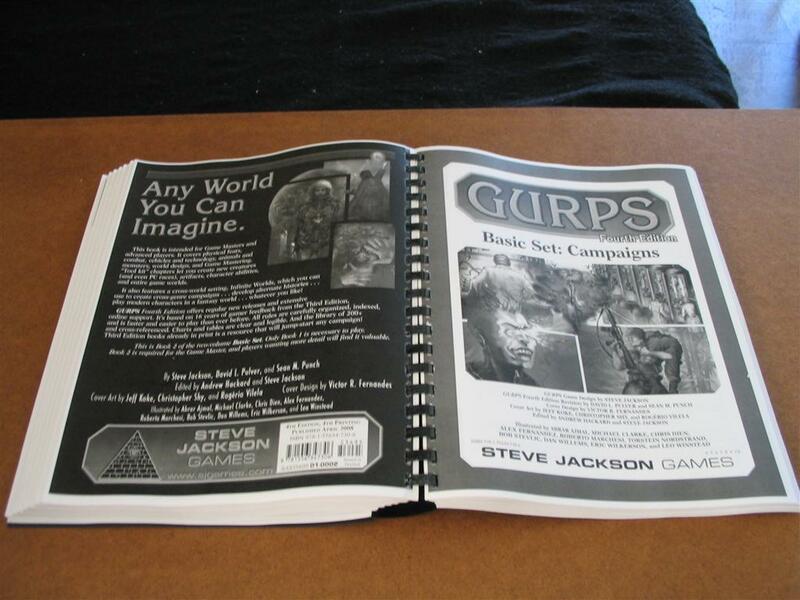 I have the Characters front cover on the front, and the Campaigns back cover on the back (the way it would look if you physically had the two books atop one another). But now I think I would prefer to have the Campaigns front cover on the back, despite that “feeling” backward. I think it was a great purchase, overall Lulu did a wonderful job, and I’m already pondering what I can save my pennies for as the next experiment. 800 pages is the Lulu limit for the “8.5 x 11”-ish book size, I believe, so…let’s see, I think you could squeeze all 15 of the Dungeon Fantasy series + Monsters + the Fire Demon adventure into a single volume! Or maybe Low Tech + the three Companions + Instant Armor + Fantasy-Tech 1 in “Tech: Volume 1,” and High-Tech, Ultra-Tech, and Bio-Tech in “Tech: Volume 2.” Ooh, I like that. Cost is an obvious fly in the ointment — any one of the three books above would cost in the three figures for all the PDFs plus the Print on Demand. 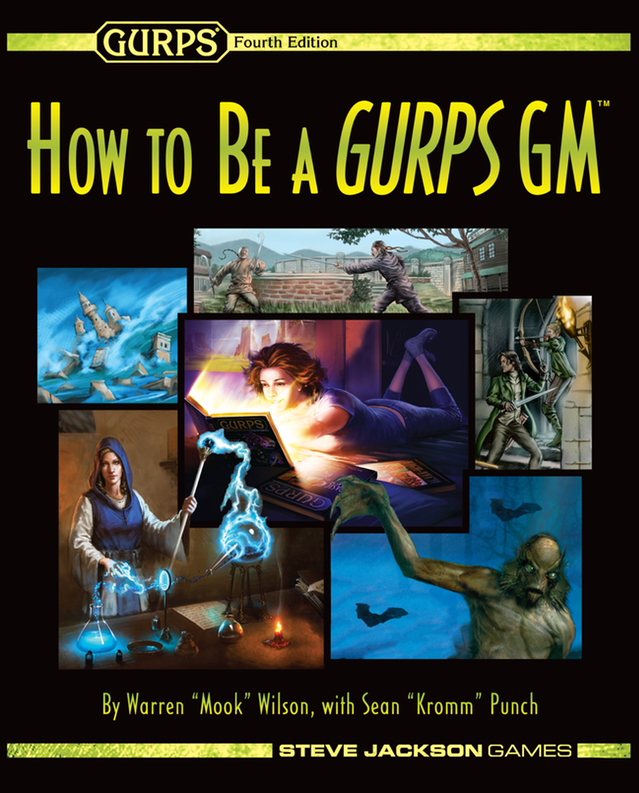 But if I really wanted to, I could completely reassemble my GURPS library into whatever I choose. Your post beautifully illustrates how plausible this is. Thank you. Wow. I’m a little surprised that Lulu can print a copyrighted book like that. I’d love to do that with some books that are out of print. I don’t know for sure, of course, but I imagine that Lulu doesn’t even bother looking at anything that is set as “Private, ordered 1 copy.” If it were set as “Public, ordered a dozen copies” they might be more interested. So based on your images, it looks like you went with the Hardcover Casewrap 8.25×10.75? is that correct? That is truly awesome. 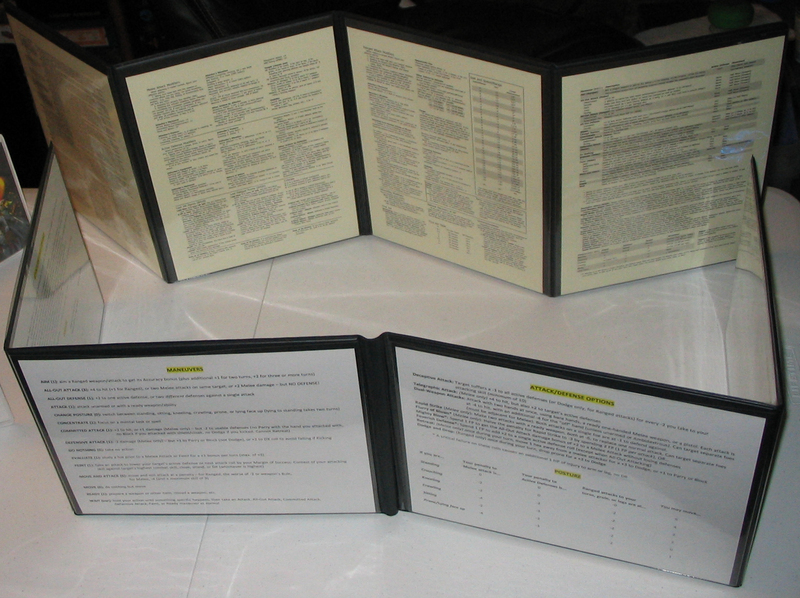 I went and purchased a comb binder about four years back so I could keep all my dungeon fantasy books together not to mention campaign notes and characters. However I think I will give Lulu a try. Cheers! Yeah, totally worth it, I think. I had used my comb-bound omnibus Basic for a few years and thought I was totally happy with it lol – until I got the perfect-bound hardcover from Lulu! So I tried this the other day. 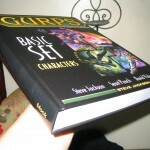 About 200 pages, perfectbound (softcover) and in full colour. $43.02 + $5.44 shipping to Canada (+$2.42 Canadian taxes.) Looks excellent. I’m really pleased. Due to my own mistake the odd pages are on the even side and visa-versa, but this isn’t much of a problem. It just means the page numbers are close to the binding and not on the outside edge. I’ll be doing this again. 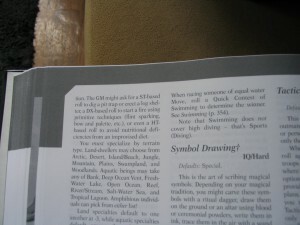 I wouldn’t use colour often, but if the book merits it, the price isn’t out of sight, and shipping is amazingly cheap. Nice! Glad to hear you’ve had similar great results, Sean. Bummer about the page numbers, but live and learn. 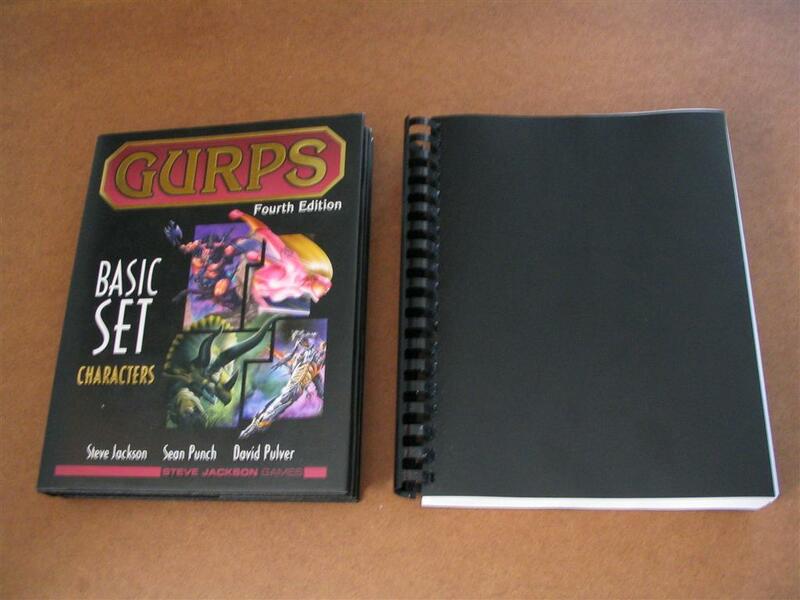 Does GURPS Basic Set use the same size for the PDFs that Thaumaturgy: Ritual Path Magic does? Do you have any tips on getting that printed to order? I would love to be able to have the mechanics from that, but I don’t know what size to use for a hardcover of it. I’m looking into doing this via Lulu because SJG has no print version of this, and I NEED to have it in print for future use. 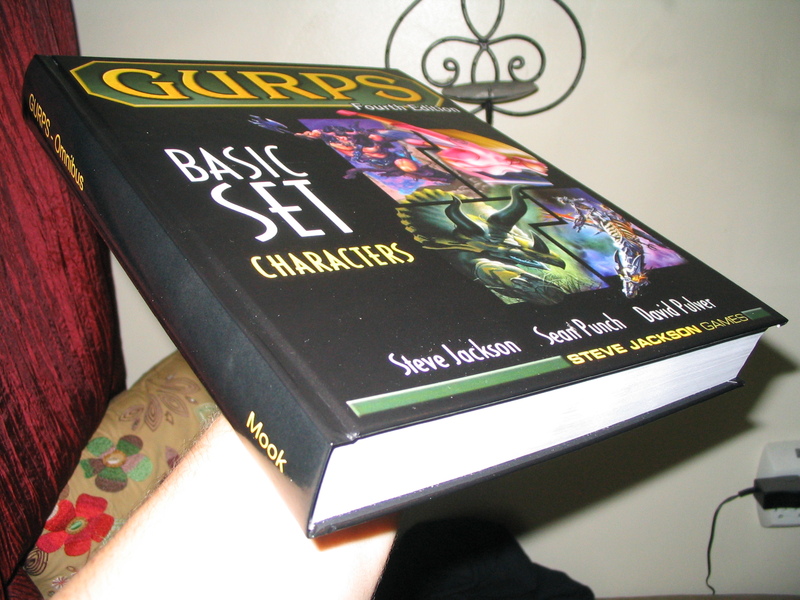 Hey Mook, did you use the combined PDF to print this? Or did you combine the individual files? I’m having trouble getting it to convert on lulu. 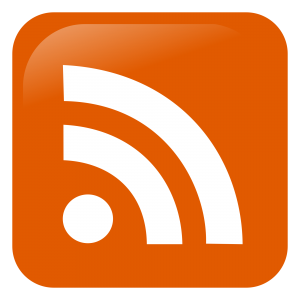 No useful error message, just generic “see formatting tips in the forums” message. 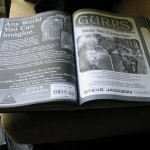 Did you do anything special when you actually set up the print job to make it work? On a side note, I’m going to try the “full color” route and see how much it costs to print. I’ll follow up and let you know what the cost difference is between B/W and color. Hiya Dan! I don’t think there is an official combined PDF (like, when you purchase the combined Characters/Campaigns Basic Set, it still comes as two PDFs). I used Acrobat to combine into a single file, and (I think – been a while!) saved the cover page as a JPG? That’s where I most often seem to have trouble, with the covers. I’ll give it a shot and let you know! 1. If you, like me, combined the files several years ago, don’t forget you did that. 😉 Specifically make note of what tools you used because if it wasn’t Acrobat, you may have issues. 2. More importantly, lulu really only works with PDF version 1.4 and earlier. 1.3 is much more stable, but supposedly 1.4 will work. Version 1.5 and 1.6 aren’t likely to work on complex files like these, and definitely won’t work for the omnibus described in this post. They may work for simpler files. 3. All pages need to be oriented the same direction. Somehow one of mine got rotated 90 degrees. 4. All pages must be the same size. This one is a bit nitpicky and sometimes it’ll work without this change, but it’s best to have the same size pages (8.5 x 11 preferably). This can be a complex process involving cropping, printing to PDF using a scaling factor and an understanding of page sizes in pts and ratios. (btw, I think this may be what caused your white stripe Mook… lack of bleed space in the characters file). VERY nitpicky to get both files combined in to a single file with consistent page size. 5. Even with all of the above, the conversion may fail. What FINALLY worked for was to save the final combined file as a “press ready” pdf. Similar verbiage in other tools may be “print ready”. THIS was what finally let me get through the conversion. The various layers and extra metadata saved in the various PDF versions can be too much for the converter. Press ready flattens and optimizes things for the press. One other point to note, all of the editing, rotating, converting, printing, cropping etc. at one point corrupted the PDF in ways that weren’t visible to the naked eye, and yet would cause conversion to fail. I had to go back to the original 2 source files, recombine them, crop them, reprint with a scaling factor to get the resulting file back up to 8.5 x 11, and then immediately use Adobe Acrobat to produce a press ready file. Translation: If it fails, it may mean you have to start over. $118.21 plus shipping ($9.99) as of early 2017. Just a Quick question since you did the full color, What is the paper quality like? 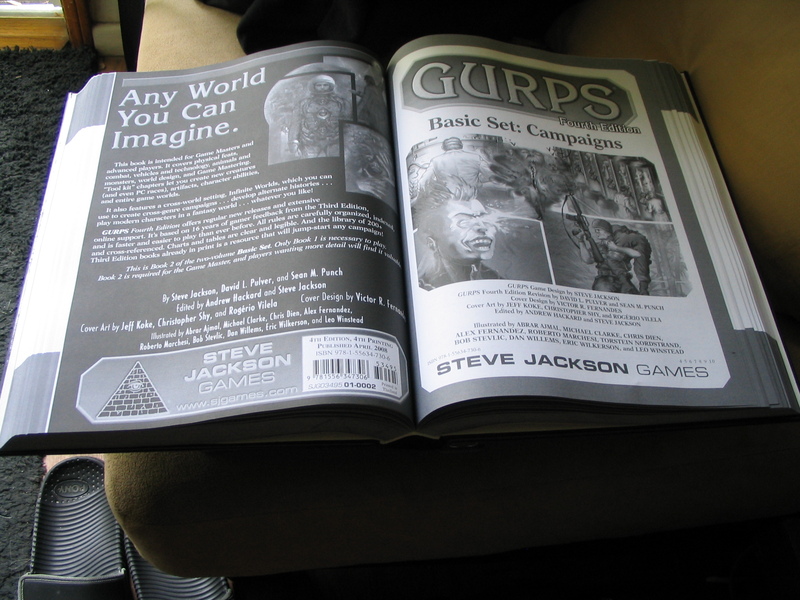 is it glossy like the “real” books or more like standard printer paper? 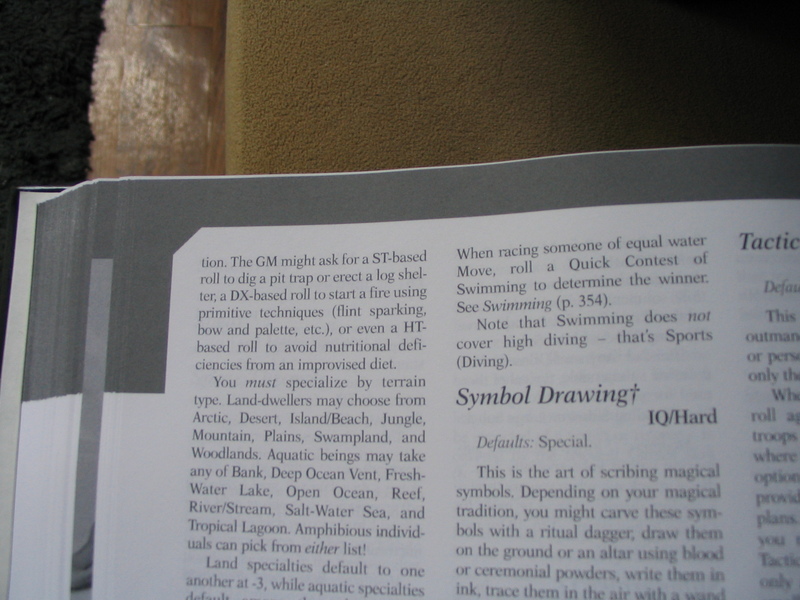 Unfortunately, the books I’ve ordered from Lulu have color *covers*, but all interior pages are black and white. I’m unsure of the color page quality (it’s so much more expensive, I’ve never met anyone who’s ordered color copies). If you ever do, I’d love to hear what you think about the paper quality.